Concert Series at Carnegie's Weill Hall. received his Bachelor, Master and Doctoral Degrees. concerts in Europe, Canada, Japan and US. Chamber Symphony under Gerard Schwarz. Music, Phantom of the Opera and Music Man. Natalie Merchant, They Might Be Giants, Michael Bolton, Smokey Robinson and Dionne Warwick. Juilliard School and Sanibel Music. He is a founding member of the Forest Hills Chamber Players (formed in 2004). reside in Tappan, New York. "Mr. Witek's technique was notable /.../, performed the difficult grace notes with ease /.../, excellent bowing technique /.../." "Exceptional, especially in the high notes, Mr. Witek's performance was tender and controlled, his technique excellent." those luscious solo lines was captivating, particularly in the final moments." On Rimsky-Korsakov's Sheherazade: "Concertmaster Krystof Witek played solo passages expertly." "/.../ played with an admirably clean technique /.../ in a sparkling fashion." personality has won hearts as well as respect. I welcome him enthusiastically." and seriousness and a splendid staccato before a sold-out house." abandon. /.../ Witek brought a distincive use of glissandos to both Mozart and Haydn /.../ and this listener found it refreshing." "Several of the solo moments were terrific. 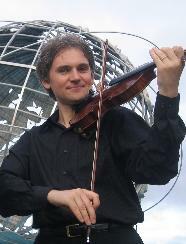 Concertmaster Krystof Witek played with fluid grace in Strauss' Don Juan."